Bill's Bayou: Nothing to see here, move along. 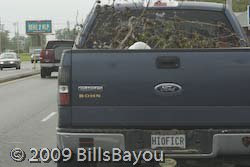 If I were driving down Airline Highway, er um, Airline Drive with an unsecured load of crap in the back of my truck, I'd want to be as pleasant to the local constabulary as possible. However, with the sticks and such flying out the back of this guys littermobile, I'm sure he'll get to say "Hi Officer" face to face.